Super simple grinder with little frills or fuss, but does its job very well. Can be a little messy if larger quantities of beans are ground, and the generally excellent aesthetic is spolied a little by the logo and the strapline printed on the front of the machine. Overall though, a good grinder and a worthy purchase. …although personally, I’m not actually sure how helpful that is and you are probably better off with a bit of experimentation, counting, and keeping your eye on the grounds through the window. In terms of the grind, I found it to be really good and managed to get a very fine grind (my personal preference) out of it. The unit comes supplied with a spare grinding blade as well, should you be such a coffee addict that you manage to wear out an entire blade – although there aren’t actually any instructions within the manual, that I could see at least, on how to change the blade? 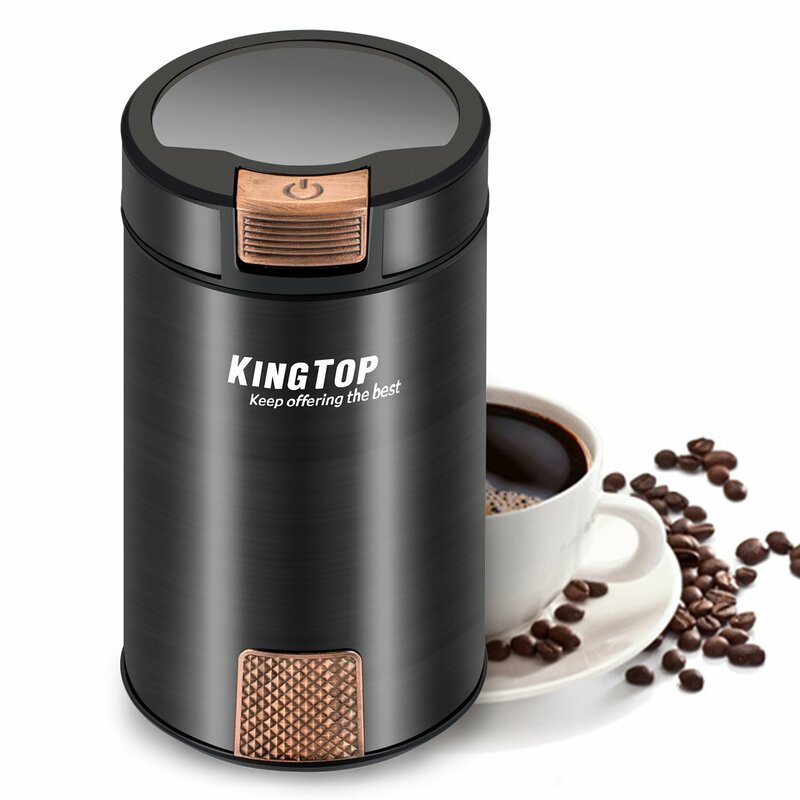 The Kingtop can also be used for grinding other seeds or beans if you so desire. I think it ruins what is otherwise a really aesthetically pleasing unit that I would be happy to keep out on my countertop. Secondly, if you fill the unit up, it can get a bit messy, with coffee grounds getting caught in the top of the chamber which then go everywhere when you open it. The grounds can also get into the seal and make shutting and locking the lid a bit tricky. The solution of course, is to grind in smaller quantities and/or shake the unit during grinding to free any stuck coffee. Not a problem for me, but if you like to grind in big batches I could see it may be a slight annoyance. Overall though, I think this is a really solid grinder that offers little frills or fuss, but just does it’s job and does it well. It sells for around £25 at the time of writing, but click here to check the current price.